Deutsche Bank AG is facing resistance from top Qatari shareholders to its merger plans with Commerzbank AG, four people familiar with the matter said. 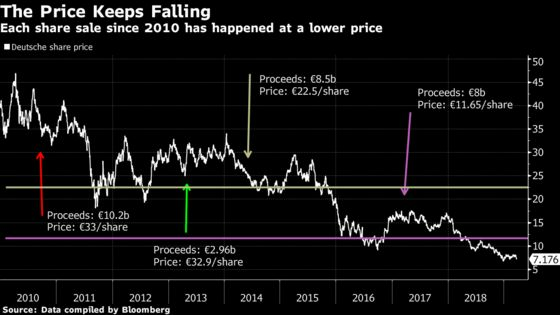 The investors are concerned that a deal would dilute their holdings if Deutsche Bank is forced to raise equity in a share sale to help fund the deal, the people said, asking not to be identified because the matter is private. The Persian Gulf nation is also seeking to negotiate other concessions before it backs the deal, the people said. Labor representatives on Deutsche Bank’s supervisory board say a merger would fail to strengthen the bank, while prompting massive job cuts. German newspaper editorials have also blasted the finance ministry’s role in orchestrating a deal between two weakened lenders. Not everyone is against the deal. Private-equity firm Cerberus Capital, which owns significant stakes in both Deutsche Bank and Commerzbank, favors a tie-up, people familiar with the matter said. The German government supports a deal as well, other people have said. Qatar is interested in pushing for more bilateral deals with Germany in other industries as a condition of backing the merger, one of the people said. Qatari entities own more than 6 percent of Deutsche Bank, which declined to comment. Qatar’s government communications office didn’t immediately respond to a request for comment. Qatar’s former ruler, Sheikh Hamad bin Khalifa Al Thani, and former prime minister Sheikh Hamad bin Jassim Al Thani couldn’t be reached. Any merger would have practical obstacles to overcome. Cost cuts -- and where to make them -- as well as balance sheet risks are set to take a central role in the merger discussions, people with knowledge of the matter have said. Commerzbank has large holdings of Italian bonds, which may need to be revalued. Deutsche Bank’s U.S. political exposure and the future of its trading unit will be tough issues, too, one of the people said. Deutsche Bank is in talks with the European Central Bank about the potential tie-up, other people briefed on the matter said. The question of whether Commerzbank’s low valuation could be used to generate regulatory capital is a particularly important topic, they said. Regulators remain skeptical of the deal and want to see a viable and profitable business model before they approve of it, they also said. A representative for the ECB declined to comment. When the price paid for an acquired company is lower than what’s known as tangible book value -- the balance sheet equity, minus intangible assets -- the acquiring firm can add some or even all of the differential to its own capital, potentially improving its regulatory capital ratios. At Commerzbank’s current market capitalization, that’s a difference of 16.5 billion euros ($18.7 billion). 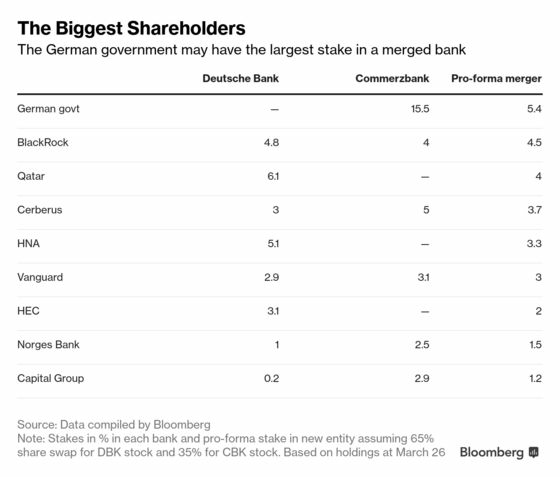 Deutsche Bank has already raised $34 billion in the past nine years from investors to fund multiple restructurings and may need a further 8 billion euros for a merger with Commerzbank, according to Christian Koch, a DZ Bank analyst. The Qatari stakes are held by investment vehicles controlled by members of the royal family and other prominent politicians. Last year, Qatar said it expected to invest 10 billion euros in the German economy over the next five years.